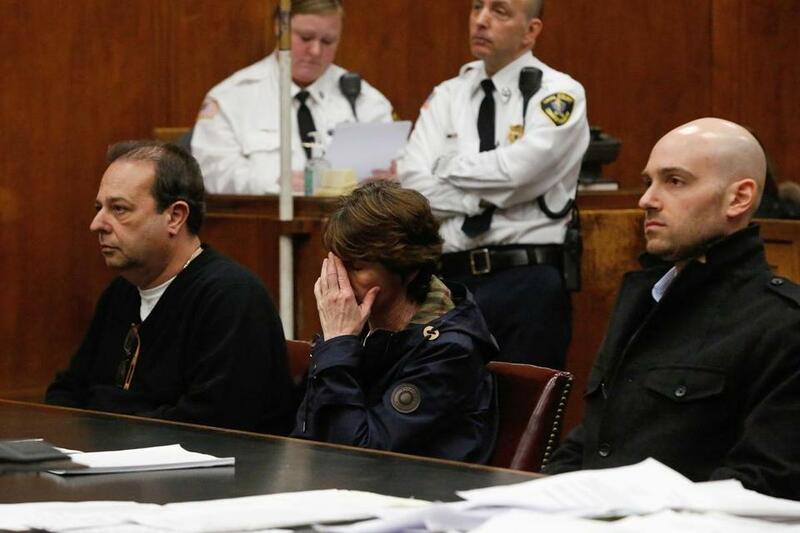 Steven Palladino (left) with his wife, Lori, and son Gregory at their sentencing on investment fraud charges in Suffolk Superior Court. A West Roxbury man was sentenced to 10 years in state prison Tuesday after pleading guilty to fleecing investors of more than $10 million in what prosecutors described as one of the largest Ponzi schemes in memory. Showing little emotion, Steven Palladino, 56, admitted to using money he had promised to invest to finance a lavish lifestyle, from gambling excursions to Las Vegas to buying expensive jewelry and cars. Prosecutors said he defrauded dozens of friends and neighbors, in some cases making off with people’s life savings. Several elderly investors took out mortgages to invest. “That kind of greed is particularly galling,” Suffolk Superior Court Judge Janet Sanders said before imposing the sentence. Palladino’s wife, Lori Palladino, and son, Gregory Palladino, also pleaded guilty to involvement in the scheme. Lori Palladino, 51, was sentenced to five years of probation, while the younger Palladino was sentenced to two years in jail. According to prosecutors, Steven Palladino told investors their money would be used to make high-interest loans to borrowers who could not obtain traditional financing, providing hefty returns at low risk. But he instead used the bulk of the money to cover gambling losses at casinos, pay rent for his mistress, and take a vacation to the Bahamas, prosecutors said. related convictions on his record, including a 2007 conviction for defrauding an elderly relative — as the “real ringleader” of the operation. As the scope of the fraud grew, the family used money from new investors to pay earlier investors, prosecutors said. Lori Palladino falsified the company’s books to make the company profitable, they said. “There was no way to pay the monthly interest without new investors,” Goldberger said. The loan company, called Viking Financial Group, was run from an office above an ice cream parlor the family owned, iScreamWorks on Centre Street. The family often transferred money from the Viking account to a separate account for personal use, Goldberger said. In 2007 and 2008, the company made two loans with 60 percent interest rates and one that charged 200 percent interest, he said. At sentencing, the family was ordered to disclose their finances to determine a restitution plan. In November, the US Securities and Exchange Commission announced that Steven Palladino and Viking Financial had been ordered to pay back nearly $10 million to victims. The family’s lawyer, Phil Tracy, said the money that remains “is not sufficient” to cover investors’ losses, and asked the judge to lighten Steven Palladino’s sentence so he could work to repay them. “He is sincere in his apology to the victims in this case,” Tracy said. His comments drew loud scoffs from several victims in the courtroom, one of whom rolled his eyes and pretended to play a violin. “I certainly hear the pain they suffered,” she said, referring to written impact statements. None of the victims made statements in court Tuesday. Tracy had asked that Steven Palladino’s sentence be delayed for a couple of days so he could attend to family matters, a request Sanders flatly rejected. “He is going to jail today,” she said. Sanders said she believed that Lori Palladino deserved a lesser sentence, saying her role was “more behind the scenes” and that she had no prior criminal record. Lori Palladino hid her face from view through much of the hearing and barely looked at her family. After Steven Palladino was sentenced, many victims shouted at him, saying “See you in 2024!” and “Bye, bye.” As he was led from the courtroom, several applauded. Outside the courtroom, Ron Nasif said he was happy to see Palladino sent to prison, but doubted he would ever be repaid for the money he lost. Nasif said he lost $2 million in the scheme and that two of his siblings also lost substantial sums.